^ 1.0 1.1 Robert, p. 110. ^ Keay, John, The Honourable Company - A History of the English East India Company, Harper Collins, London, 1991, p. 289. ^ Thomas Babington Macaulay, "Lord Clive," Essays (London), 1891, pp.511–13 (First published in the Edinburgh Review, January 1840). ^ Gibbs, Vicary (Editor). The Complete Peerage, Volume III. St Catherine's Press. 1912: 325. ^ Sailing Ship "Dodington" (history). Dodington Family. [10 July 2008]. （原始内容存档于2005年1月14日）. ^ Keay, John, The Honourable Company—A History of the English East India Company, HarperCollins, London, 1991, ISBN 978-0-00-217515-9 p. 269. ^ Sir William Wilson Hunter. The Indian Empire: Its Peoples, History, and Products. Trübner & Company. 1886: 381– [11 July 2012]. ^ S.R. Sharma. Mughal Empire in India: A Systematic Study Including Source Material. Atlantic Publishers & Dist. 1 January 1999: 767– [11 July 2012]. ISBN 978-81-7156-819-2. ^ L.S.S. O`malley. Bihar And Orissa District Gazetteers Patna. Concept Publishing Company. 1924: 29– [11 July 2012]. ISBN 978-81-7268-121-0. ^ 13.0 13.1 P.J. Marshall, Bengal: The British Bridgehead (Cambridge), 1988, pp.78–83,144. ^ 15.0 15.1 15.2 15.3 Gibbs, Vicary (Editor). The Complete Peerage, Volume III. St Catherine's Press. 1912: 326. ^ Bence-Jones, Mark. Clive of India. Constable. 1974: 299. ISBN 0-09-459830-4. ^ Watney, John. Clive of India. Saxon House. 1974: 216–217. ISBN 0-347-00008-8. Burhan Ibn Hasan, Tuzak-I-Walajahi, University of Madras, 1934. H.E.Busteed, Echoes from Old Calcutta, Calcutta, 1908. Harvey, Robert. A Few Bloody Noses: The American Revolutionary War. Constable & Robinson, 2004. A. Mervyn Davies, Clive of Plassey, London, 1939. Michael Edwardes, The Battle of Plassey and the Conquest of Bengal, London, 1963. Mark Bence-Jones, Clive of India, London, 1974. P.J. 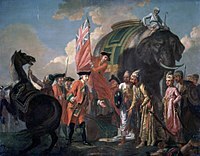 Marshall, Bengal, The British Bridgehead: Eastern India 1740–1828, Cambridge, 1988. Malleson, George. Lord Clive. Oxford: Clarendon Press. 1893. OCLC 2143228. Treasure, Geoffrey. Who's Who in Early Hanoverian Britain, 1714-1789. Stackpole Books. 2002. ISBN 0811716430.